The Campaign Builder Checklist updates with "to do" items as you add elements to your Campaign Map. You must complete these items before publishing your Campaign. The items appear as links, in blue. 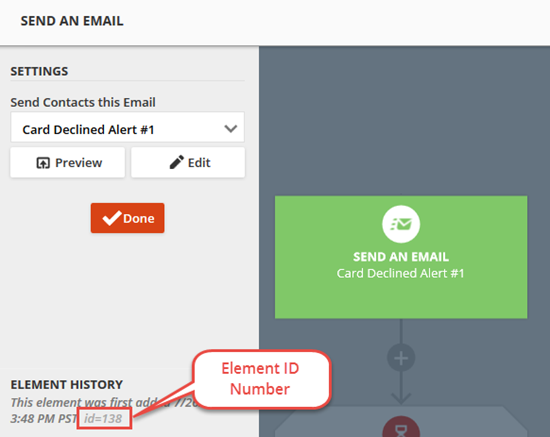 Click the link to go to that element to complete the configuration. 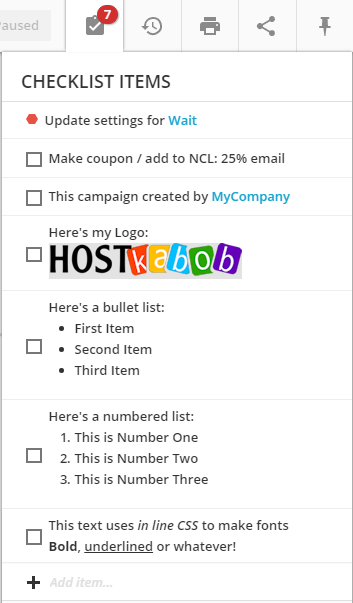 You can add your own content or "to do" items to the Checklist. The Campaign can still be published with unchecked items that you have added. This allows you to brand the Checklist with your logo, create backlinks, etc. before you share the Campaign in the Marketplace. Or, to add reminders for the future, after the Campaign is published. When you share a Campaign in the Marketplace your entries into the Checklist appear in the recipient's copy of the Campaign. This allows you to brand your Campaigns with a logo, provide backlinks, etc. Campaign Builder Notes allow you to annotate on the Campaign Map itself. In Edit Mode, click the Campaign Builder Notes icon and drag the new note to it's location on the map. In the Campaign's Edit Mode you can move the note, delete the note, increase the font size and adjust the size of the note. Campaign Builder Notes can only be added and edited in Edit Mode. The Note will be displayed in Performance Mode after saving the Campaign in Edit Mode. Saving the Campaign Map in Edit Mode will save the Notes. If you are saving a revision of the original Campaign and do not publish it, the new Notes will not appear in Performance Mode. 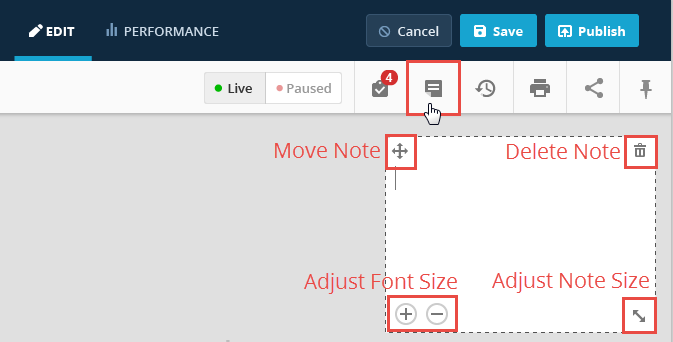 When you publish the revision, the Notes will appear in Performance Mode as well as in Edit Mode.